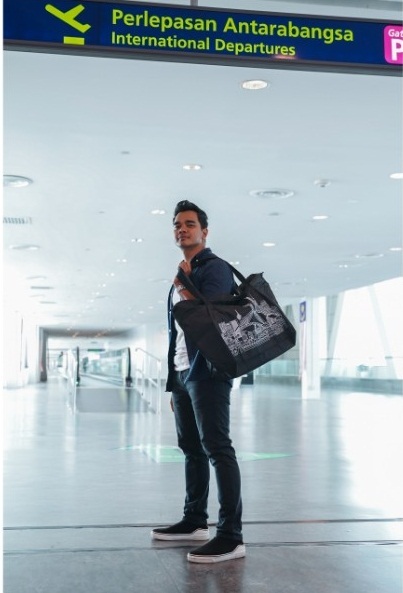 Malaysia Airports today introduced its limited edition ‘Kembara’ travel bag, in celebration of KL International Airport’s (KLIA) 20th anniversary. Portraying the beautiful cityscape of Kuala Lumpur, this exclusive travel bag is a must-have Malaysian souvenir for travellers. Prioritising strength and abrasion resistance, this stylish black carry-on travel bag is made of 1680 D Ballistic Nylon and is specifically designed for the convenience of travellers. Suitable for both long distance and day travel, the bag can be purchased at its recommended retail selling price of RM88.00. As part of Malaysia Airports’ initiative to add value to the shopping experience at the airport, visitors and travellers are also eligible to get this exclusive travel bag at a promotion price of RM55.00 with a minimum spend of RM250.00 for Malaysia Airlines customers (including flight ticket); or RM250.00 spend via Boost App; or RM250.00 spend with Maybank Credit/Charge Card at any retail outlets in KLIA or klia2. Customers who purchase the limited edition ‘Kembara’ travel bag after a minimum spend of RM250 via the respective channels will automatically get 20 entries when they participate in Malaysia Airports’ ‘Licence to Win’ shopping contest. This would place them at a position where they would stand 20 times more chances to win an Aston Martin DB11. In light of the increasing number of Chinese passengers arriving at KLIA, Malaysia Airports is also teaming up with Alipay to reward its users. The collaboration enables wider reach to Chinese passengers, who can then purchase this exclusive merchandise at only RM55.00 with an accumulated spending of over 500RMB via Alipay Mobile App. The limited edition ‘Kembara’ travel bag is available at participating outlets in both KLIA and klia2. For more details on the ‘Licence to Win’ contest, visit us at https://licencetowin.com.my. Malaysia Airports is one of the world’s largest airport operator groups in terms of number of passengers handled. It manages and operates 39 airports in Malaysia and one international airport in Istanbul, Turkey. The 39 airports in Malaysia comprise five international airports, 16 domestic airports and 18 Short Take-Off and Landing Ports (STOLports). Its main airport, the Kuala Lumpur International Airport, which also houses klia2, the 4th best terminal serving low-cost carriers (as rated by Skytrax for year 2018) is striving towards being the preferred global aviation hub. The two latest marketing awards won by Malaysia Airports at the prestigious Routes Asia 2018 for the “Overall” and “Over 20 Million Passengers” categories are a testimony to the organisation’s commitment in providing the best connectivity at all its airports. Over the years, Malaysia Airports and its airports have also received numerous other awards that acknowledged its commitment towards excellence in various areas such as service, engagement, corporate responsibility and governance. For more information on MAHB, please visit www.malaysiaairports.com.my. Follow us on Twitter @MY_Airports, Facebook @MalaysiaAirports & Instagram @indulgemalaysiaairports.